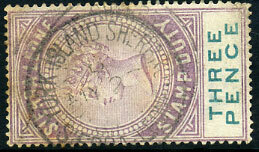 on QV 4c carmine INLAND REVENUE (SG.R1), very rare. 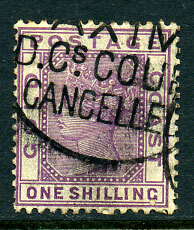 (164.01) part dated B/MY 27 -- on 1886 QV 3d lilac & green STAMP DUTY issue Crown CA wmk, some toning. 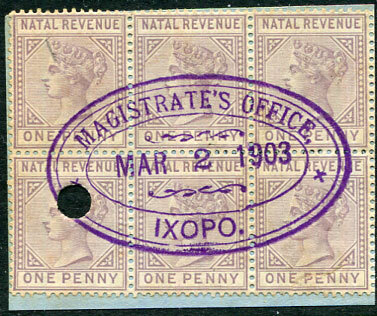 forged cds dated */MY 18 0(4) or 0(5) on manuscript cleaned QV 1/- REVENUE CC wmk (SG.R3), scarce on this denomination. 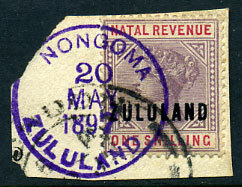 (Z.7) in purple dated 20 MAY 1897 on Natal ovp'd "ZULULAND" QV 1/- REVENUE piece. 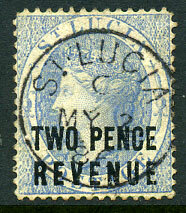 on QV 1/- CA wmk (SG.18). purple NONDWENI (Z.4) - JAN 93, fair large part upr. 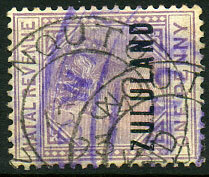 showing DWE lettering with fine fullish NQUTU (Z.9) 15 JA 93 on QV 1d (SG.F1).